Welcome to Episode #26 of the Living Homegrown Podcast! This week I interview my good friend Erica Strauss of NW Edible Life. She’s a blogger, mother, and homesteader living just north of Seattle, WA. And Erica ALSO has a brand new book that relates to us foodie, homesteader types. And by “brand new”, I mean…it was just released a few days ago! The Hands on Home: A Seasonal Guide to Cooking, Preserving and Natural Homekeeping. The book is all about keeping a more productive home, kitchen and lifestyle through DIY projects. You save money, time and end up feeling good about what you do. For this interview we focus on being efficient with the food we work so hard to grow ourselves or source locally. And there are a couple bloopers after the closing music…Ha! Modern Homesteading – The PBS episode of Growing A Greener World TV (#523) where I featured Erica as one of the modern homesteaders. I bought an extra copy of The Hands-On Home book to give away. But unfortunately, the giveaway is now closed. You can still leave a comment – it just won’ t count toward the giveaway. Honestly, you can leave any comment you like and I will count it toward the drawing. Leave and comment below and good luck! Once again another very helpful show that is helping me and my family move to a healthier lifestyle. I am so glad you are getting value from the podcast, Jeff. I’m a cook who gardens I suppose, but it is a hard distinction to make. Love the podcast and this episode! Glad you are enjoying the podcast Sara! I’m definitely “one of you”, currently more of a gardener (or perhaps a small-scale farmer) but once the compost pile is stacked and the snow hits, you can find me in kitchen! I’m a gardener who cooks. I think I’m more of a gardener who cooks but living in a small apartment makes the gardening a bit tough. I do my best with herbs and tomatoes and love using them in my cooking! Hmm…..I’m not sure! I am learning to garden and really enjoy cooking homegrown veggies. I would LIKE to be a gardener who cooks, because I feel like that means I’d be getting really good at gardening! Both – gardening and cooking have been part of my life since I was a kid. My favorite memories always have something to do with Grandpa’s veggies or fruit. I love Erica’s weekly email updates. I am so excited to see that you two are connected. Thanks, Theresa, for all your valuable insights. Thanks Stephanie – Theresa is one of my favorite people of all time. I’m blessed to know her. I’m…..a person who loves food harvested out my back yard and made into meals. Or maybe I just like to eat good food. Still debating the subtle differences on that. I am not sure what category that puts me in. I think that means you can check ALL the boxes, Amy. So happy to know that you like the podcast! I am a gardener who is learning to cook what I grow. I would say I switch between being primarily a cook that gardens ( as that is how I got started) to becoming a gardener who cooks ( and cans, freezes, dehydrates, etc) during the height of the growing season when an abundance of produce is coming in left and right! Love your show…thanks for the inspiration and your enthusiasm! So happy you are enjoying the show Beth. Erica always gives such great info. She is an easy interview. I’m a cook who likes to gardens, although I don’t always know what to do with the stuff I grow! I’d like to be more deliberate on what I grow, but I’m working on it! I have a small garden and enjoy cooking! I want to preserve more and waste less! I’m a gardener who cooks! And cans and loves to bake. Love your podcast! Thanks for telling me Sarah! Glad you like it. I am a cook that married a garden and also discovered CSA’s. Right now we also have chickens! I am a challenged gardener in Arizona! When I bring a harvest into my kitchen I am challenged again. Love to be creative in every way. I’m a cook and a gardener, but not an expert at either. 🙂 I do have to say I’m a much better cook when I utilize the garden, for inspiration and awesome ingredients. I have loved Erica’s blog for ages, super excited to check out her book. Hey thanks for having a contest that I don’t have to have Facebook for! Thanks for reading Alyssa – I think anyone who gardens starts out at an advantage in the kitchen – we have the really fresh produce! I am an urban farmer who loves to cook. My husband is a Master Food Preserver and farmer’s market manager. We share and teach our community to appreciate home grwn food. Well, that is a partnership made in heaven! I’m a home cook who gardens some. Love growing herbs because they add such flavor and beauty to a dish. Enjoy cooking because you can be so creative and it’s more healthy too. Love your podcast for all of the helpful and interesting topics that keeps my juices flowing- Thanks for this opportunity to win this fabulous book! Thank you for telling me Carol. It means a lot to me to know you are liking the podcast. I am always cooking up better ways to garden given my skills and my resources and growing my passion to cook by learning to bake, broil or boil what my garden gave me. This year, I’m more of a cook who gardens than the other way around (although I have high hopes for shifting back towards more gardening next year…). I would describe myself as a gardener who cooks during the summer and fall but more of a cook who gardens during the winter and early spring. Keep up the great work. Yes Christopher – As I told Erica many times…she is an easy interview. Always full of great info and tips. Plus, she is funny as heck. I live to garden and I garden to cook with better ingredients. I call gardening my “gateway drug.” It has led me down a path to pickling, jamming, drying, Monarch raising, nature photography, and even more cooking! I am a senior gardener with a small garden and I love to cook. I am always looking for ways to maximize my use of garden space and new ideas for preserving and cooking our small harvest. This book looks like it would be a big help. Thanks. Great podcast – thanks! Erica’s philosophy is near and dear to my heart – no waste! I loved her story about how they saved the ends of the tomatoes after slicing for hamburgers and used the bits and pieces for salad or bruschetta! Such a great idea. And vinegar out of peach peels – genius! I would love to win a copy of her book – thanks for the opportunity! I have been cooking for years and gardening for 2 years, but I think I like gardening more. I love your podcast! Definitely a gardener who cooks, but more like a gardener who ‘puts up’. Jam and pickles, oh yeah! I Love to garden, Love to cook, love to cook what comes in from the garden, love to preserve from the garden. I also volunteer as am Extension Master Gardener here in Minnesota. I follow your weekly email and love them, Its a favorite for me as i aspire to be more in all i do. Thank you for being a subscriber Susie! I am a cook who wants to garden. The book looks great – thank you for letting us know about it and thank you for the give-away! I love this podcast. It gives me an extra reason to be exited about fridays ! I’d say I’m more of a cook who gardens, but really I just love creating stuff in general, be it food, plants, art, etc. Ahh Delphie – you made my day. Thank you! Just started listening and really enjoying the podcast. I am a gardner who cooks. And truly enjoy canning. It connects me. I’m a cook and semi-successful gardener. It’s a journey. Would enjoy winning this beautiful book! I’m a theoretical gardener. All the gardens I’ve put in while renting different houses in Oregon have befallen one disaster after another. One year the sheep escaped and ate everything. The next year I was hit by boring beetles in the root veggies, more jumbo slugs than a dozen bowls of beer could drown, leaf mold and some other bug that ate all my leaves. Then I moved on to small trees, which the deer ate. So I tried an indoor tree that my cat destroyed so utterly that it couldn’t be saved. So the next garden will be inside of a greenhouse fortress containing zero animals and have raised beds…you know, once I can actually afford to build one, that it. I think you may have to invest in a full time security guard Amanda. Sheesh! I love that you don’t give up. Its a process and you are gaining experience…just perhaps not the type of experience you were planning on! I’m a cook and gardener and student of life. I’m great cook and a mediocre gardener. I’m a gardener who cooks at the moment. When my garden slows down I’m definately a cook with a freezer and jars full of things from my garden to experiment with. Oh Yeah! I am so honored to be your first podcast to follow Mandy. I will try my best not to let you down! I’m a wannabe Gardner that cooks for the littles. 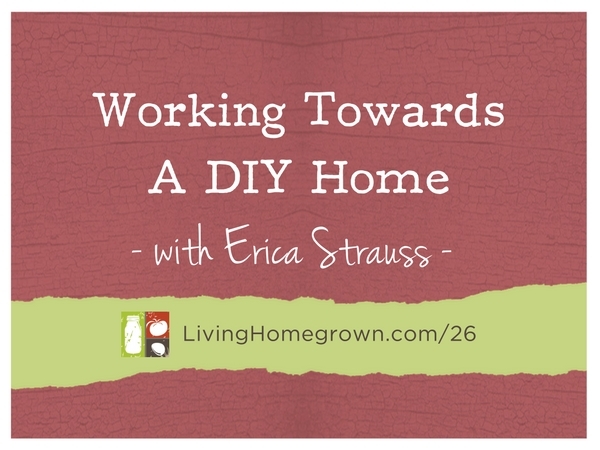 I love Erica’s blog and can’t wait to become.more of an urban homesteader. I’m a gardener who’s lucky to be marred to someone who cooks! I guess I’m both a cook who gardens and gardener who cooks. I think they both fit together quite well 🙂 I’ve been following Erica’s blog for a quite a while and am thrilled for the chance to win her book. Thanks so much! I’m a cook who gardens, and grows things to cook with, and occasionally who finds things in the kitchen to grow in the garden. I’m a gardener who cooks! I’m a gardener who cooks, although the cooking part is generally only when the mood strikes. Luckily I have a spouse who keeps me fed on a regular basis! Just started listening and love the podcast and I would love to win this book! I am getting more and more into this homesteading lifestyle and am so excited to share this with my young children as they grow! It’s been a few years since I planted anything (too busy with my biz) and when we suspected the summer would be hot and glorious, planted 3 organic Washington Cherry tomatoes from PCC. It has been delightful to get back in the kitchen with ingredients just steps away!! I’m a former urban balcony/rental house gardener who is trying to tame her new country yard and learning to garden all over again and preserve what she grows. This podcast is wonderful help!! I’m a cook who loves to garden. A recent accomplishment was whipping up dishes with homegrown garlic–yum! Love both Living Homegrown and Northwest Edible Life. I’m a cook who dabbles in gardening, but would like to get a lot better at the latter! Ha! I have a podcast episode coming up on exactly that problem, Sarina. It will air in a few weeks so stay tuned! I am obsessed with gardening AND cooking….don’t make me choose! So excited about this book! I cook and garden and love both! I would love a copy of this book! Hmmm, gardener or cook….chicken or egg….hard to say which came first. I’m a gardener who cooks and am looking forward to Erica’s new book! I’m a cook who is planning to build a raised bed garden next season. I’ve started canning (applesauce, apple butter and tomatoes) this fall using locally sourced fruit. I am excited about exploring an urban homesteading lifestyle and enjoyed your conversation with Erica. I stopped at my local library and while they don’t yet have her book, I picked up a few others. I enjoy your podcast and the practical advice I can apply weekly to my home. Thanks for your good work and I am looking forward to more! I am a cook who gardens. Thank you for kindly sharing your wealth of knowledge. Appreciate all I’ve learned so far. I garden to support my canning habits. I’m a cook who gardens or maybe I’m a gardener who cooks. It depends on the day or week. My kids and grandkids call my place “the farm”. The hope is to grow and preserve as much of my own food as possible. I’m enjoying learning a little more each time I listen to your podcast. Yes I must agree that being passionate about doing things at home. Starting a third square foot garden. I have lions I planted three years ago, you think I should pulled them to regevinate the soil. They survive the Ohio winters and bloom every year. Suitable life style great people think I’m crazy. What do they know. Thanks for your podcasts.